• STRIPED BASS fishing is good on the back side of the “thunder” full moon, especially at night and during the weekday when there is less boat traffic. The bass have set up on reefs, in typical fashion for this time of the year. Dawn and dusk is prime time for large stripers on the reefs, rip areas and lower coastal tidal rivers. Live lining eels, bunker or hickory shad has been the ticket to land a “cow” bass. Striper areas include the Watch Hill reefs, lower Thames River, the Race, Plum Gut, Pigeon Rip, outer Bartlett Reef, Black Point, Hatchett Reef, lower Connecticut River (Great Island), Long Sand Shoal, Cornfield Point, Southwest Reef (outer), Westbrook, Sixmile Reef, Falkner Island area, the reefs off Branford, New Haven Harbor (including Sandy Point), Charles Island area, lower Housatonic River, buoys 18 and 20 off Stratford Point, Stratford Shoal/Middle Ground, Bridgeport Harbor, Penfield Reef, around the Norwalk Islands, and Cable and Anchor Reef. Night fishing is good at the DEEP Marine Headquarters fishing pier and Harkness Memorial Park. • FLUKE fishing has been solid (good numbers of fish) throughout Long Island Sound. The walls at New Haven and West Haven have been producing. Deep water (80-100) off Hatchett Reef and Black Point is also fishing well, along with Long Sand Shoal. The best bite has been between the CT and Thames Rivers in 40 -100 feet. You have got to put your time in and be mobile moving from spot to spot. It’s time to start fishing deeper to improve your chances for a “doormat” fluke. Fluke spots include south shore of Fishers Island (Isabella Beach, Wilderness Point), Watch Hill to Napatree Point, off the Stonington breakwater, mouth of the Mystic River to Groton Long Point, Lower Thames River channel, Gardiners Bay over to Greenport, NY, Twotree Channel, Black Point/Niantic Bay, Long Sand Shoal, Westbrook-Clinton area, Falkner Island area, New Haven Harbor to West Haven, off the mouth of the Housatonic River, Norwalk Islands, and across over to Port Jefferson, NY. Minimum size is 18 inches and the daily creel limit is 5 fish per person. 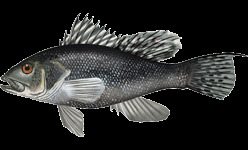 • BLACK SEA BASS fishing is now steadily improving again as they feed heavily after the spawn. The Charles Island area along with Stratford Shoal (11B) has been producing. Deeper you fish the bigger the sea bass. Fish shallower and you will catch some keeper-sized sea bass along with summer flounder, a lot of sea robins and smooth dogfish (aka sandsharks). CT black sea bass regulations are as follows...15 inch min. length, 5 fish daily limit from May 1st to December 31st. Berkely Gulp (swimming mullet), on a jig along with squid with a spinner works great for these “Bucketmouths”. Clams and sandworms also work well. • PORGY fishing is very good in Long Island Sound. Any spot with hard bottom (structure) is worth fishing on. The mouth of the Housatonic River to Charles Island and also along Morningside (Milford) is fantastic. Fishing from shore try Stratford Seawall at high tide. Rocky Neck State Park, Harkness Memorial State Park, Meigs Point Hammonassett, Sherwood Island State Park and Fort Trumbull State Park. Locate your favorite Enhanced Shore Fishing Opportunities for these hard fighting and excellent eating “Reef Slammers”. These “panfish of the sea” are easily caught on sandworms/cut squid or any other small piece of bait. • WEAKFISH fishing has surprised many anglers...good catches of “squeteague” are occurring while anglers bottom fish for fluke and sea bass. Good fishing in Niantic (Black Point), New Haven Harbor by the breakwaters over to Woodmont/Milford Point and along Stratford shoals to Darien. One of the best eating saltwater fish you will ever catch and it’s also the state fish of Delaware. • BLUEFISH fishing is very good and the summer bite is on. Find the birds and the countless pods of juvenile and adult menhaden found throughout the sound and its game on. The time is now to plan a “deep sea” fishing trip with a party charter boat and fish for those “alligator” sized blues. The Race, Plum Gut, many of the major rocky reefs, rips, and shoal areas in LIS are the best bets at this time. Diamond jigs, trolling parachute jigs or umbrella rigs, and using fresh bunker or hickory shad chunks on three-way bottom rigs have all been effective. Other bluefish spots include the Sluiceway, Gardiners Bay, Peconic Bays, and the north shore of Long Island along with the Stratford Shoal Housatonic River area. My recommendation is to hook up with a Party or Charter Boat and enjoy some of the best FISHING you will ever experience. There is no harder fighting fish in the sea. “Snappers” (juvenile bluefish) and “Harbor Blues” (16 - 22 inches) are also very common along all shore locations. These under sized bluefish provide great sport for shore anglers. Try the lower reaches of tidal rivers and estuaries...you will be glad you did as these predators push the bait up rivers. • HICKORY SHAD fishing is good once again. “They are back”, as one angler remarked. Try the Black Hall River, Lieutenant and Branford River, lower Connecticut River by the DEEP Marine Headquarters fishing pier and in Clinton Harbor. Flood or the beginning of the Ebb tide is typically the best time and lure choices are a willow leaf (silver or copper), kastmaster (single hook), small plastic jigs (white, red or chartreuse), and or shad darts in various colors. You will be impressed with these “high flyers”. • STRIPED SEAROBIN fishing is amazingly very good throughout LIS for this “hardhead fish with spines and large pectoral fins”. There is no shortage of robins as boat or shore anglers are enjoying some family fishing fun. These beautiful and strange looking fish are now very common especially when bottom fishing at many of Connecticut’s shore fishing sites. With many fish measuring over 20 inches, 3 pounds and “barking up a storm” (grunting noise they make when handling them). They love sandworms, squid and any live o dead bait. They are also very good to eat. Please be careful when handling them...be mindful of their spines located on top of their head and gill cover. • BLACKFISH fishing has slowed as the water temps get above 72Fand they are spawning. However, shore anglers continue to score on large “taug”. Find a rock pile or piling close to casting distance and hang on. The daily creel limit is 2 fish per person and the minimum size is 16 inches. Tautog love eating crabs...try green, Asian and hermit crabs for bait. Look for tautog in shallow water as they finish spawning over shellfish beds, pilings with mussel beds and rock (reef) piles (8 to 30 ft). • WHITE PERCH fishing remains good for those dedicated and patient anglers. Spend some time relaxing in any coastal estuary with a little piece of bait (shrimp/sandworm) on a small hook, enjoying some jumbo white perch on the flood tide. Wow, they are good eating. Perch are found in shallow water at any estuary, tidal river and cove along Connecticut’s shoreline. Productive spots include the Pawcatuck River (Stanton Weir Pit/Point), Mystic River, upper Thames River and Niantic River, lower Connecticut River (DEEP Marine Headquarters fishing pier), Black Hall River, Lieutenant River, North/South Cove and Hamburg Cove. Grass Shrimp and or a small piece of sandworm fished on the bottom are the keys to success. • BLUE CRAB fishing fishing is good. Crabs are done with the first shed and are continuing to mate. With some patience you can catch a lot of blue crabs of all sizes. Please remember it’s mating season for the crabs and release all egg-bearing females (sooks or lemon bellies). Crabbers note: If you release the female...more males will venture into the area and improve your overall crab catches. There are some large “jimmies” (male crabs) being captured (8.5/8” spike to spike) along with some impressive sooks (females up to 7.25 inches carapace width). Remember...all egg bearing females must be released without avoidable injury. Minimum carapace length is 5 inches for a hard shell crab.